This salad works well as an appetizer as well. 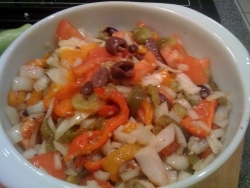 You'll enjoy the mix of flavors from the peppers and olives. The hot pepper is optional, though I recommend it. You can make it milder by using 1 pepper, or removing all the seeds, or both. Roast peppers on a foil lined baking sheet at 400 F, turning until all sides are seared. Remove and place in a paper bag (or bags). Close and leave until cool enough to handle. When cool, the skins should peel right off easily. Remove seeds and cut peppers into strips. Mix tomatoes, onions, garlic and olives to to peppers and mix. Prepare the dressing by mixing the olive oil, red wine vinegar and salt and pepper. Whisk and and adjust seasoning as required. Mix with pepper salad and serve! This came out really well. I used kalamata olives as suggested. This dish was not spicy hot - though I imagine it could be if you used hot peppers like the Hungarian peppers. We served this cold as a side dish. It goes very well with pita!